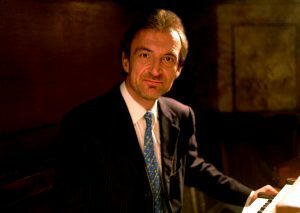 Iain Simcock was organ scholar at St. George’s Chapel, Windsor Castle and Christ Church, Oxford, before being appointed Sub-Organist at Westminster Abbey and, for seven years, Assistant Master of Music at Westminster Cathedral. He was the first British prize-winner in the Chartres International Organ Competition, as well as prizewinner in competitions in St. Omer and Odense in Denmark. He studied with David Sanger in London and Jean Langlais in Paris. He recorded several CDs for Hyperion Records with the choir of Westminster Cathedral as well as several solo organ recordings, including two Symphonies by Louis Vierne and notably the world première recording of Christus – A Passion Symphony for Organ by Francis Pott. During this period, recital tours took him all over Europe as well as to Australia. He also appeared regularly on BBC radio and television and played in two BBC Proms concerts at the Royal Albert Hall. He gave many duo concerts during this time with Jonathan Freeman-Attwood (trumpet), now Principal of the Royal Academy of Music. In 1994, Iain was appointed professor of choral singing at the Conservatoire National in Angers, France and organist at the Abbey of Saint Pierre in Solesmes, whilst continuing his solo freelance career. He performed the complete organ works of Bach in Angers in 1996, recording a solo CD of highlights from the performances. He also performed all Bach’s major harpsichord works including the Goldberg Variations on the famous Taskin harpsichord in the Russell Collection at the Edinburgh Festival. From 2001-2014 he was the musical director of the Académie Vocale de Paris, performing weekly concerts with the choir as well as concerts in many major festivals. He was instigator of two major radio France programmes featuring the monks of Solesmes and the Académie Vocale, focusing on the great Solesmes tradition of the restoration of Gregorian chant. He also worked with the opera houses in Nantes, Lyon and Bordeaux, preparing young singers for roles in Britten A Midsummer Night’s Dream, The Turn of the Screw, Debussy Pelléas et Mélisande, Berlioz Damnation of Faust, Mozart Magic Flute and as assistant to Jane Glover and harpsichordist for Handel Jephtha. He continues to perform regularly as both organist and harpsichordist, recently returning from playing in the Royal Opera House in Muscat, Oman, which has the largest organ in the Middle-East. He continues his connection with the Abbey of Solesmes and also with the Benedictines of S.Madeleine at Le Barroux, having been the advisor for the new organ currently under construction for the Abbey church. One of Iain’s first assignments for the Schola Gregoriana will be to lead workshops and direct the chant in the liturgy for the Young Catholic Adults retreat at Douai Abbey: 7-9 September 2018.